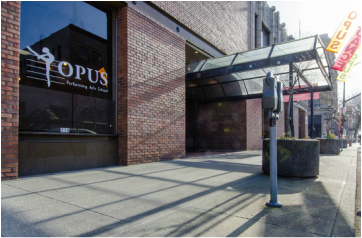 Opus Performing Arts is located at 114 W Holly Street between Cornwall and Commercial in downtown Bellingham. We are across the street from GreenHouse; we are the building with the large steel and glass awning that extends all the way across the sidewalk to the street. For long time Bellingham residents, we are in the former Sportsman's Chalet building.